Delaware may be tiny in terms of its size, but in terms of its bold action for ocean conservation and the protection of the apex predators that sustain our marine resources Delaware is a giant. As I've posted before, sharks are not the monster in this scenario, we humans are. The numbers speak for themselves. 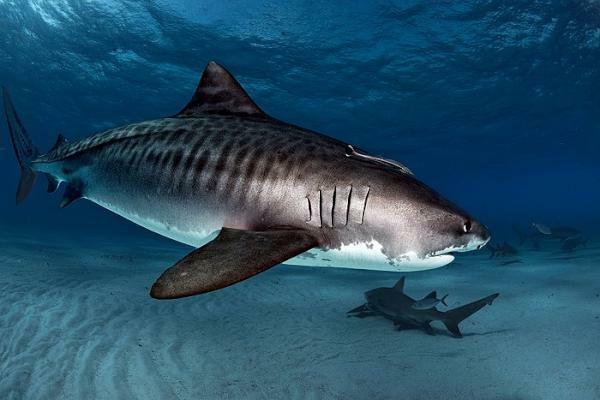 Many shark species have declined in population by more than 90 percent in the last 50 years. Some species may have declined by as much as 97-99 percent in the last 35 years. In other words, as few as one out of 100 may be left of some species. The demand for shark fins is what drives almost all shark deaths. The practice of finning is more gruesome than a Hollywood horror flick: Sharks' fins are sliced off and then the shark bodies are thrown overboard as waste. Unable to swim and bleeding to death, they suffer a slow and torturous death. But since sharks play a vital role in maintaining the health of our oceans, (which sustain and feed us), we must course correct. Studies have shown that reduction in one species can have detrimental, long-lasting effects on not only other species, but on entire ecosystems and local and regional economies. Animals at the top of the food chain, such as sharks, are slow to mature, and have very few young. Some sharks take up to 25 years to reach sexual maturity, have a long gestation period (upwards of a year), and only have a few offspring in the end. Altogether, that means that sharks are extremely sensitive to fishing pressures, and are slow to recover from overfishing. While sharks are often caught accidentally (called by-catch), a global market exists for shark fins, the main ingredient in shark fin soup. Shark fins can fetch upwards $600 a pound, putting this critically important species in the merciless hands of greedy, profit seekers. But thanks to the leadership of the forward thinking men and women in the states above this tide is turning. Congratulations to Delaware for charting a course of protection for sharks and inspiring more positive change for our oceans.